The Egyptian military has released a statement on Tuesday vehemently denying reports that Israeli military planes on Monday had trespassed on Egyptian airspace as "lies and disinformation." 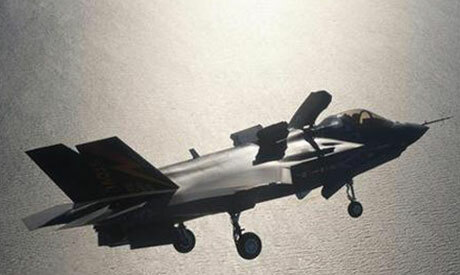 "There are instigators who spread disinformation and lies that six Israeli F-35 planes entered Egyptian airspace," said military spokesman Colonel Mohamed Ahmed Ali. At dawn Monday, many Cairo residents were awakened by military planes flying over the skies of the capital, in some cases breaking the sound barrier. Other governorates – including Alexandria, Beni Suef and Damietta – were also affected. The military promptly released a statement saying that the aircraft that had broken the sound barrier over Cairo had belonged to the Egyptian Air Force and had merely been testing the country’s air-defence systems. However, a number of subsequent reports to emerge online claimed that six Israeli F-35 fighters had invaded Egyptian airspace. The Egyptian military responded by saying that the advanced F-35s were not even in use yet by the US Air Force, and would not be available to Israel's air force before 2016. Ali stressed that the Egyptian Armed Forces generally do not conduct military exercises on public holidays. Sometimes, however, they do hold "unplanned exercises," he added, to test the competence of Egypt's air force. "The exercises that took place at dawn were meant to take the Air Force by surprise and test its ability to secure Egyptian airspace and respond to emergency situations," the spokesman said. On Monday night, the anonymous 'Officers for the Revolution' Facebook page, allegedly run by pro-revolution army officers, released a different version of the story. They claimed that six Israeli F-15 military planes had entered Egyptian airspace in order to "display Israeli military superiority and its control over the area." The officers' movement went on to accuse the Egyptian military of propagating lies and "trying to convince the Egyptian people that what happened was simply aerial military exercises by the Egyptian armed forces and take advantage of the fact that the people don't know the rules of military exercises." They then claimed that, according to military regulations, exercises cannot be performed during public holidays unless Egyptian airspace has actually been breached. The officers also said that, according to Egyptian regulations, military exercises are not permitted before 6am, meaning that the planes – which appeared over Cairo's skies at dawn – had not belonged to the Egyptian Air Force. They added that regulations also banned military planes from flying low or breaking the sound barrier over residential areas. The movement went on to compare the Monday incident to an alleged Israeli air strike last week on an arms factory in Sudan. "What happened in Egyptian airspace is no different to what happened in Sudanese airspace, where several factories were destroyed," the officers' statement read. "Israel knows every tiny detail about the Egyptian Air Force, because it has dealt with the same system since the 1973 war." This jet isn't even in service yet, but how???? Let's just say hypothetically speaking that this was an Israeli incursion into Egyptian airspace- I understand the Military's need to keep it all hushed up. If the people's faith in the strength of the armed forces is shaken then the country as a whole will suffer a strong psychological blow like that of '67. But to deny an action or the possibility of an action like this from occurring is arrogance... Edge close to Russian & Chinese technologies e.g. The joint financed S-400 SAM defense system, a couple of Su-27s, change/reform rigid and classic and antiquated air force guidelines/procedures, retrofit your aging fleet of fighters and air defense technologies and capabilities, etc. But most importantly turn to the East for your supplies for the West has been castrated by NGOs and Lobbies. Do something that insures that your military doesn't receive a global 'front-page' style black eye like your neighbor Sudan. You owe at least that much to the Egyptian people. The Zionist can not attack Iran. So they stick to there tradition in Bombing Arabs like in Sudan. Don`t let the Zionist fool egypt in to a War. So How Did They Score? If this was just a test of Egypt's air defences, how did they do? If this was a violation of Egypt's air space by Israel, shouldn't Egypt make a big stink about this so that they can lobby for better air defence equipment or justify the remilitarization of Sinai? Saying that 6 Israeli jets flew into Egypt is a little detailed to be a bold faced lie, so I have to question which account I believe. Additionally, I doubt that the Egyptian air force would be reckless and rude enough to break the sound barrier that early in the morning on a holiday over residential areas. This sounds like an act of intimidation, which the Israelis do every so ofter over Lebanon. Maybe Egypt should return the favor. Sorry brother but if the EAF sent 6 jets towards Isreal Im afraid they would be on a 1 way trip. "Saying that 6 Israeli jets flew into Egypt is a little detailed to be a bold faced lie, so I have to question which account I believe." Do you also believe that the 2010 series of shark attacks in the Red Sea was the result of a Mossad plot? Conspiracy theories seem very popular in Egypt, with unlikely suggestions that its troubles are somehow caused by Israel. Are you aware that such claims makes you an international laughing stock?